The Medicine Mountains monastery as the name suggest is one of the oldest monasteries in India. It is a brightly and colorful place greatly know as the center of festivity, color, vibrancy, especially on the new year's eve. Cham and Bon's dances are performed and above all happiness is celebrated in the tranquillity of the place. The Monastery has an enormous statue of Lord Shenrab Mibo that seeks the attention of many visitors. Menri Monastery is 12 km from Solan. The temple was earlier a simple stone building bereft of rich decorations but now massive concrete Tibetan style buildings cover the monastery having temples, library, Bon dialectic, school, dormitories, and nunnery. Today around 350 monks are there in the monastery and it has also developed as a major center of religious learning and ritual activity. Famous for its Apsara and Paalnaam dance, this centre was founded by Niranjan Pathakdeva and features a wide collection of traditional Assamese utensils, jewellery and handicrafts. Old utensils, jewellery and handicrafts are also housed in the centre. Thai Monastery, Bodhgaya is an example of exquisite art and architecture. The Thai Monastery houses a beautiful Thai Temple also called the Wat Thai. The Thai Monastery was built by the Royal Government of Thailand on request of our ex-Prime Minister Jawaharlal Nehru to commemorate the 2500 years of Buddhism. The Thai Temple of Bodhgaya is also an example of Indo-Thai friendship. The Thai Temple has a 25-meter high bronze statue of Lord Buddha with his hair tied in a bun catches the eye. The Thai Temple is adorned with a sloping and curved roof which is covered with golden tiles is an example of Thai architecture. The corners of the temple are decorated with images and carvings of Buddha in different forms. The temple also organizes meditation classes in morning and evening. The Monastery also organizes retreats every year in the month of January that includes meditation practices, teachings on awakening, insight meditation, instruction on Yoga and interactive session on liberation and daily life issues. The aura is very serene and thus you can find many meditation centers near the monastery. Located amidst sandal groves in Coorg is the Namdroling Monastery. It takes credit as the largest teaching centre of Nyingmapa in India. The monastery has a peaceful ambience where a few minutes of prayer can rejuvenate the mind. It is the perfect destination for soul seekers. Also known as the Golden Temple, it boasts of a golden idol of Buddha with Tibetan mythology paintings depicting the phases of Buddha&#39;s life. You can get the feel of Tibet with the shopping stalls, clanging of bells and the sizzling aroma of momos. The monks and the daily prayers add oomph to the atmosphere. The various festivities and ceremonies attract tourists all round the year. Come enjoy a slice of Tibet in this monastery. Pha That Luang is a gold-covered large Buddhist stupa in the centre of Vientiane, Laos; a symbol of Buddhist religion and Lao sovereignty. Legend has it that Ashokan missionaries from India erected a tâht (stupa) here to enclose a piece of Buddha's breastbone as early as the 3rd century BC. Wat Arun, Wat Chaeng, Temple of Dawn is a Buddhist temple in Bangkok Yai district of Bangkok. The temple derives its name from the Hindu god Aruna often personified as the radiations of the rising sun. Wat Arun is among the best known of Thailand's landmarks and the first light of the morning reflects off the surface of the temple with pearly iridescence. Wat Arun was envisioned by King Taksin in 1768. It is believed that after fighting his way out of Ayutthaya, which was taken over by a Burmese army at the time, he arrived at this temple just as dawn was breaking. This was the chief satra patronized by the Ahom Ruler. This ancient educational centre is visited by thousand of devotees all throughtout the year. Rasotsava, a prime festival of Assam, is celebrated with great enthusiasm and passion here. The huge statue of Maitreya adds charm to Diskit. It is visible far away before entering to Diskit. This impressive statue of Maitreya Buddha that stands at a gigantic height of 106 feet is a huge tourist attraction in Diskit. Going through the curvy roads or sandy trails, are options to reach here at the top. You can view the city with inhabited along the Shyok river. The view clearly encompasses the horizon, city, mountains and river perfectly. The beautifully carved and decorated statue is the new place for prayers and meditation. The Lachung Monastery is an ancient Nyingma Buddhist Gompa positioned at the confluence of the Lachen River and Lachung River, tributaries of the Teesta River. To see the Lamas meditate or study in their classes simply feels amazing. The silence and placid aura of the place leaves some everlasting moments in one's memories. The place is so tranquil, the monastery sits on a very lush green surrounding which will bring peace instantaneously. Thien Vien Truc Lam is one of the largest Zen meditation study centres in Vietnam. Adherents practice self-reliance and realization through meditation. This is probably the largest Buddhist construction in Vietnam after 1975. The temple is near the Tuyen Lam Lake, located on Phuong Hoang. Key Gompa is a Tibetan Buddhist Monastery located at an altitude of 4166m close to the Spiti river, in the Spiti Valley in Himachal Pradesh. It is the biggest Buddhist monastery in the Spiti Valley. It is about 7 km from Kibber village on the Kibber-Kaza road. This monastery dates back to 10000 AD and is one of the oldest in the Spiti valley. Due to the haphazard growth, the structure looks like a box with temples built on top of one another. It resembles a fort. The scenic views of the mountains and the barren cold desert provide the most spectacular views on this Earth. Bokar Monastery is the most favourite place in Mirik after the Mirik Lake. Located in the Darjeeling hills, Bokar Ngedon Chokhor Ling is a thriving monastic centre in Mirik with nearly five hundred monks. The monks are fully devoted to studying, practising and sustaining the teachings of Shakyamuni Buddha. The monastery was founded as a small retreat centre but over the time it has evolved into two retreat centres, monastic college, and a Shedra. The place is located at the highest peak of Mirik. The view from this peak point is wonderful and delight to eyes. The monastery is an epitome of Chinese architecture and has sprawling lawns to sit and observe the place. It is a few minutes' walk from the Mirik lake. The monastery takes pride in being one of the most important monasteries for Buddhists in India and also one of few in India that has retained its traditional beliefs. Covered with colorful frescoes and murals dating back to 12 th Century lies Kardang Gompa, which is 5 km away from Keylong. It is considered to be the oldest monastery with a backdrop of the bare mountains of the Rangcha Massif and a flowing river Bhaga on its embankments. Kardang Gompa (or monastery) houses a huge repository of some exquisite thangka paintings, old weapons and musical instruments. It is a home of 30 monks and nuns having equal rights. Also, apart from being the key monastery of the Lahaul Valley, it is also the home of the remains of Lama Norbu, the founder of the Gompa. Other features of this gompa are a large golden Buddha statue, statues of Guru Padmasambhava, Tara Devi and Tayden Shakyashree from the Tibetan lineage and a magnificent statue of Avalokiteshvara. Boudhanath is a stupa in Kathmandu, Nepal. It is known as Khāsti in Nepal Bhasa, Jyarung Khashor in Tibetan language or as Bauddha by speakers of Nepali. Gyuto Monastery is the abode of Karmapa, the head of the Kagyn Tibetan Buddhism and is known for its courses offered in Tantric Meditation, Tantric Ritual Arts and Buddhist philosophy. Located in Sidhbhari, with 8 km from Dharamshala, it can be easily accessed through road transport and can be visited perennially. It was founded by the main discipline of the 1 st Dalai Lama in 1474 and was re-established in India in 1959 after the Chinese invasion. The teaching lineages have been passed on to younger generations of monks for more than 500 years. The main chamber of the monastery has a majestic statue of the Buddha, with a spectacular backdrop of snow-clad mountains. You can enjoy serenity and tranquility in this place and be a part of this magnificent culture and surroundings. The Hanle monastery or the Analy Gompa is Buddhist monastery of the Tibetan Drukpa Kagyu branch of Tibetan Buddhism. It was established in the 17th century and is located in the Hanle Valley, Leh District, Ladakh. Located at a height of 14000 ft, it is one of the largest and best known monasteries of the valley. It is home to about 10 monks and another 33 come for regular prayers. It also houses the Indian Astronomical Observatory. Exquisite wall paintings adorn the walls of the monastery. The location of this place is highly sensitive due to the close proximity of the Tibetan / Chinese border and special permission is needed to visit by the Indian Government. Accommodation is available on the Tsaka La Road, south of Rhongo. There are a few eateries near the monastery. The best time to visit is between June and September. The Royal Bhutan Monastery of Bodhgaya is one of the major monasteries that showcases some of the most important instances from the life of Lord Buddha. The Bhutanese Monastery is one of the finest architecture built in Pagoda style of traditional Bhutan architecture. The monastery also houses Bhutan Temple which attracts tourists from all over the world. The Bhutan Temple and Monastery was built by Bhutan Government in collaboration with the Buddhist Monks of Bodhgaya. The Royal Bhutan Temple, Bodhgaya has a seven-feet high image of Lord Buddha which is further carved with the Buddhist symbols and scriptures. The inner walls of the temple are also carved with small figurines depicting the stages of Buddha's life. The Bhutan monastery also has a guesthouse where you can stay overnight in spacious rooms. It has 15 spacious rooms providing facilities or AC rooms with attached bathrooms. You need not pay anything for Bhutan Temple accommodation but you should consider donating some amount towards the maintenance of the monastery. The Ghoom Monastery or popularly called as Yiga Choeling Gompa is one of the oldest Tibetan Buddhist monasteries in Darjeeling. It the most famous monastery of the region and also a prime tourist attraction in Darjeeling. 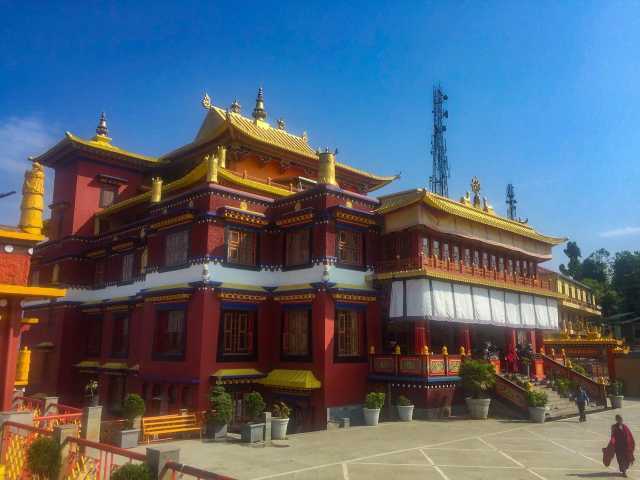 Located at a distance of 8 km from Darjeeling, the old monastery was built in the year 1850 and enshrines a 5 m high statue of Jampa ( Maitreya or 'Future Buddha' ) and 300 beautifully bound Tibetan texts. The 15 feet whooping statue is seated at the entrance of the Ghoom Monastery. There are bells, ornate thanka scrolls as well as drums inside the Gompa Monastery. It is the best place for that tourist who is in search of peace and serenity. The Ghoom Monastery also preserves some rare, handwritten Buddhist manuscripts. The entry to the monastery is free but photography inside the monastery will cost your Rs. 10/- per photo and Rs. 50/- for a video shot.